John French Sloan (August 2, 1871 – September 7, 1951) was a twentieth-century painter and etcher and one of the founders of the Ashcan school of American art. He was also a member of the group known as The Eight. He is best known for his urban genre scenes and ability to capture the essence of neighborhood life in New York City, often observed through his Chelsea studio window. 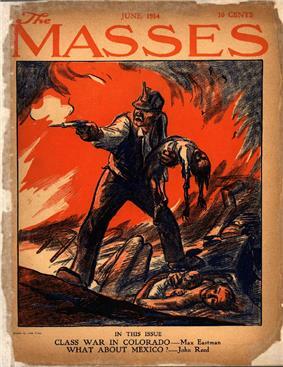 Sloan has been called "the premier artist of the Ashcan School who painted the inexhaustible energy and life of New York City during the first decades of the twentieth century" and an "early twentieth-century realist painter who embraced the principles of Socialism and placed his artistic talents at the service of those beliefs." John Sloan was born in Lock Haven, Pennsylvania, on August 2, 1871, to James Dixon, a man with artistic leanings who made an unsteady income in a succession of jobs, and Henrietta Sloan, a schoolteacher from an affluent family. Sloan grew up in Philadelphia, Pennsylvania, where he lived and worked until 1904, when he moved to New York City. He and his two sisters were encouraged to draw and paint from an early age. In the fall of 1884 he enrolled at the prestigious Central High School in Philadelphia, where his classmates included William Glackens and Albert C. Barnes. 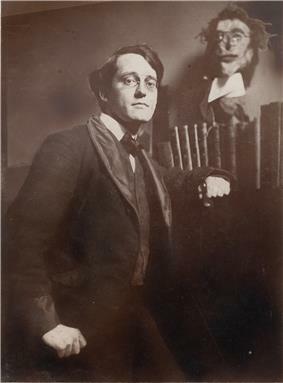 In the spring of 1888, his father experienced a mental breakdown that left him unable to work, and Sloan became responsible, at the age of sixteen, for the support of his parents and sisters. He dropped out of school in order to work full-time as an assistant cashier at Porter and Coates, a bookstore and seller of fine prints. His duties were light, allowing him many hours to read the books and examine the works in the store's print department. It was there that Sloan created his earliest surviving works, among which are pen and ink copies after Dürer and Rembrandt. He also began making etchings, which were sold in the store for a modest sum. In 1890, the offer of a higher salary persuaded Sloan to leave his position to work for A. Edward Newton, a former clerk for Porter and Coates who had opened his own stationery store. At Newton's, Sloan designed greeting cards and calendars and continued to work on his etchings. In that same year he also attended a night drawing class at the Spring Garden Institute, which provided him his first formal art training. 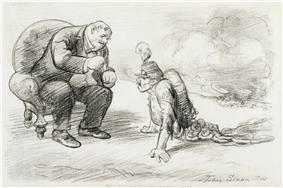 In 1892, Sloan met Everett Shinn. ^ Larry E. Gobrecht (November 1986). "National Register of Historic Places Registration: Bronxville Post Office". 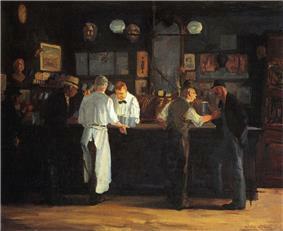 John Sloan's paintings are represented in almost all major American museums. Among his best-known works are Hairdresser's Window (1907) in the collection of the Wadsworth Atheneum, The Picnic Ground (1907) in the collection of the Whitney Museum of American Art, The Haymarket (1907) in the collection of the Brooklyn Museum, Yeats at Petitpas in the collection of the Corcoran Gallery of Art, McSorley's Bar (1912) in the collection of the Detroit Institute of Arts, The 'City' from Greenwich Village (1922) in the collection of the National Gallery of Art, and The White Way (1927) in the collection of the Philadelphia Museum of Art. In 1971, his painting Wake of the Ferry (1907) was reproduced on a U.S. postage stamp honoring Sloan. In the late 1920s, just as the market for his city pictures was finally reaching a point at which he might have made a comfortable living, Sloan changed his technique and abandoned his characteristic urban subject matter in favor of underpainting and glazing method used by old masters such as Andrea Mantegna. It was an eccentric choice. The resulting paintings, which often made unconventional use of superimposed hatchings to define the forms, have never attained the popularity of his early Ashcan works. Whenever Sloan was asked about the social context of his paintings or about his fervent Socialism, he said that his paintings were made with "sympathy, but no social consciousness...I was never interested in putting propaganda into my paintings, so it annoys me when art historians try to interpret my city life pictures as 'socially conscious.' I saw the everyday life of the people, and on the whole I picked out bits of joy in human life for my subject matter." As someone who painted city crowds and tenement rooms, shop girls and streetwalkers, charwomen and hairdressers, John Sloan is one of the artists most closely identified with the Ashcan School. Yet it was a term Sloan despised. He came to feel that it homogenized too many different painters, concentrated viewers' attention on content rather than style, and presupposed a muckraking intent. His wariness was not misplaced: exhibitions of Ashcan art in recent decades often stress its documentary quality and importance as part of an historical record, whereas Sloan felt that any artist worth anything had to be appreciated for his skilled brushwork, color, and composition. Sloan's early paintings may have been influenced by William Morris Hunt's Talks on Art. Henri believed in the need to create a new, less genteel American art that spoke more immediately to the spirit of the age, an outlook that found ready adherents in Sloan and Glackens. At a young age, Sloan had been exposed to numerous books and reproductions through his uncle, Alexander Priestley, who held an extensive collection in his library. One major influence that he discovered was poster movement; these works combine the influences of European artists of the late nineteenth and early twentieth century, including Walter Crane, and reveal Sloan's study of Botticelli and Japanese prints. John Sloan's training consisted of his study and reproduction of works by painters such as Rembrandt, a few classes at various institutions, mentorship by Robert Henri, and his work experience as an etcher and draughtsman. The high school that Sloan attended had a good art department, but it is not known whether he gained any training there. Sloan worked several jobs in draughtsmanship, etching, and commercial artwork before he attended the Pennsylvania Academy of the Fine Arts, where he studied briefly under Thomas Anshutz. The experience Sloan gathered from his various press jobs provided him with a certain amount of knowledge and allowed room for him to explore and expand in his free time. 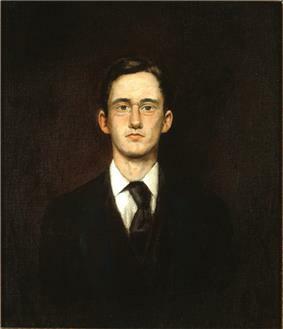 Henri's mentorship was significant in Sloan's training because he encouraged him to paint more, and introduced him to the work of various artists, whose techniques, composition, and style Sloan studied. He sought additional guidance from Ruskin's The Elements of Drawing and John Collier's A Manual of Oil Painting. Sloan believed his study and mentorship at the Pennsylvania Academy of the Fine Arts, as well as his early Philadelphia experiences, to be his "college education." In 1943, Dolly Sloan died of coronary heart disease. The next year, Sloan married Helen Farr, a former student forty years his junior with whom he had been romantically involved for a time in the 1930s. On September 7, 1951, John Sloan died of cancer while vacationing in Hanover, New Hampshire. The following January the Whitney Museum of American Art presented a well-received retrospective of his career. Helen Farr Sloan, who became a noted philanthropist in her later years, oversaw the distribution of his unsold works to major museums throughout the country. The summer of 1918 was the last he spent in Gloucester. For the next thirty years, he spent four months each summer in Santa Fe, New Mexico, where the desert landscape inspired a new concentration on the rendering of form. Still, the majority of his works were completed in New York. As a result of his time in the Southwest, he and Dolly developed a strong interest in Native American arts and ceremonies and, back in New York, became advocates of Indian artists. He also championed the work of Diego Rivera, whom he called "the one artist on this continent who is in the class of the old masters." 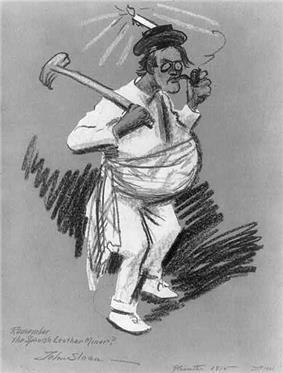 The Society of Independent Artists, which Sloan had co-founded in 1916, gave Rivera and José Clemente Orozco their first showing in the United States in 1920. Beginning in 1914, Sloan taught at the  He disdained careerism among artists and urged his pupils to find joy in the creative process alone.